Who wants to do some snowshoe day trips? 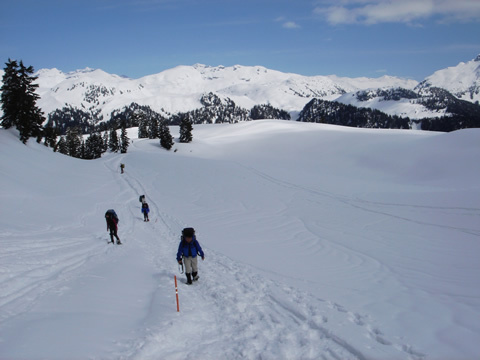 If anyone is interested in coming along for some day snowshoe trips into Garibaldi Park, let me know. We’re looking at going out tomorrow and again on February 4, 11 & 25. We’ll probably hit the trail into the Diamond Head area tomorrow. Nothing too aggressive, just a recon and conditioning trip. We’ll probably leave around 9 or 10 am and be back by dinner time at the latest. For the moment, you will need your own gear. (604-982-8248 – ask for Pat or Donna). We're out having another fun adventure! ~~~~~~~~~~~~~~~~~~~~~~~~~~~~~ Track us on-line live on MapShare: See link directly below this box. ~~~~~~~~~~~~~~~~~~~~~~~~~~~~~ We'll update our blog with stories & photos when we get back! ~~~~~~~~~~~~~~~~~~~~~~~~~~~~~ Play safe and BE PREPARED!